New Hampshire lawmakers only get paid $100 a year — not exactly enough to feed a family — so it’s no surprise that many of them rely on other sources of income to get by. As a result, state lawmakers end up dealing with all kinds of proposals that can directly impact their family finances, the taxes they pay, the companies where they work, or the boards on which they serve. In policing these potential conflicts of interest, New Hampshire’s ethics rules tend to favor disclosure over recusal — which means that, with few exceptions, legislators are allowed to vote on or even sponsor legislation that has a clear benefit to their personal interests. As a result, it’s not unusual to see landlords sponsoring bills dealing with evictions or security deposits, state retirees voting on changes to state retirement benefits, or business owners setting the rates for the very same business taxes they have to pay. And if you ask State House leaders, this is a feature, not a bug. “I think people elect legislators who have a basis of knowledge and that lends itself to more thoughtful legislation,” says Senate President Donna Soucy. As the leader of the New Hampshire Senate, Soucy is one of the most powerful people at the capitol. But she’s also an attorney for the Professional Fire Fighters of New Hampshire, an influential labor union. Soucy started working for the firefighters’ union on Feb. 20, 2018, according to an amended financial disclosure form she filed after taking the position. As required by the legislative ethics rules, Soucy filed paperwork to disclose that her new position could create a conflict of interest. But she still opted to vote on the bills despite those potential conflicts. Soucy says she wasn’t able to remove her name as a sponsor of those bills after taking the job with the firefighters’ union, but she also said she has “a long history of advocacy on behalf of firefighter issues” that predated her employment with the union. Voting in the face of potential conflicts is far from rare at the State House. Take Senate Minority Leader Chuck Morse. When he’s not in Concord, the Salem Republican runs a plant nursery, and at the State House he’s not shy about speaking up about how bills on the minimum wage, hiring practices or employment benefits would affect companies like his. The way Morse sees it, voters sent him to Concord, at least in part, because of his perspective as a businessman, so it’s only natural that his voting record would reflect that. This is the prevailing thinking inside the State House: If you force lawmakers to sit out each time they have a conflict, pretty soon, you won’t have anyone to participate at all. Or, as House Majority Leader Doug Ley argues, you’ll just end up with people who are underqualified for the job. Ley's testimony on school voucher legislation and a number of other bills is highlighted on the union's website. Ley’s outside experience includes his job as a history professor. But it also includes his current position as the paid president of New Hampshire’s chapter of the American Federation of Teachers, a union that represents thousands of educators and staff across the state. AFT-New Hampshire frequently rallies its members to take action on all kinds of bills at the state level — and Ley has repeatedly testified in favor of the union’s positions on legislation dealing with union fees, school vouchers, teacher employment protections and more. In 2017 and 2018, Ley was also authoring the group’s “legislative bulletins” — weekly updates that encouraged the union’s members to contact his colleagues at the State House to lobby for or against certain bills related to education. The bulletins that appear on the union’s website for this session are unsigned, but Ley said he still contributes to them occasionally. 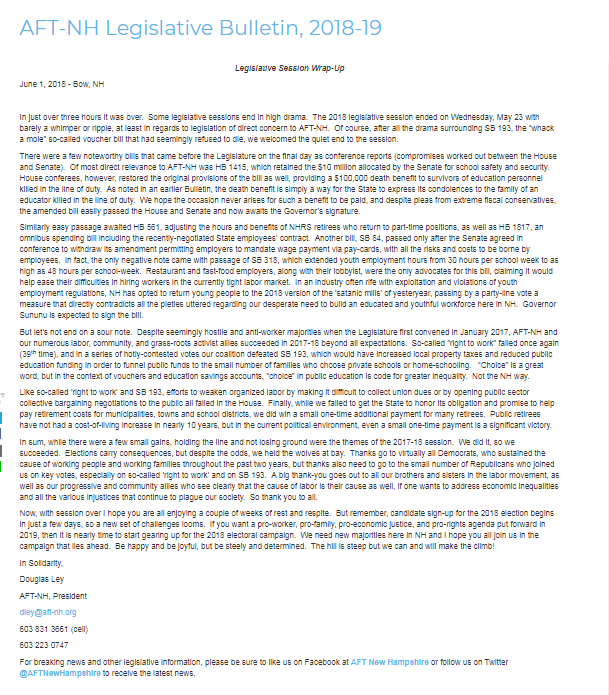 Ley signed off on a number of the union's legislative bulletins throughout the last few years. While these activities might sound like the kind of work you’d expect from a lobbyist, not a legislator, Ley is adamant that his first duty is to the people in his district. Ley could not identify an instance when he has opposed the union’s position on a bill, but he said his personal views often align with the group’s on education matters anyway. While Ley is open about his role with AFT-New Hampshire, he has not filed any written disclosures indicating that he has a conflict on any of the bills the union has supported or opposed in the last two years. In the same span of time, AFT-New Hampshire has taken a stance on dozens of bills, according to legislative tracking tables and legislative bulletins on its website. New Hampshire lawmakers are required to file paperwork at the beginning of each session to disclose any sources of household income above $10,000, as well as any additional financial interests that could intersect with their legislative work. But lawmakers are also supposed to file additional written disclosures, called “declaration of intent” forms, when a specific piece of legislation could have an outsize effect on them or a household member. Ley said he was under the impression that he fulfilled his responsibilities under the ethics rules by listing his position with AFT-New Hampshire on the financial interest paperwork and verbally disclosing it during any public testimony. He said he didn’t fill out any additional written disclosures on specific pieces of legislation because those bills would not have had an outsize effect on AFT-New Hampshire over other groups that were also affected. New Hampshire’s ethics rules do say a simple verbal disclosure — for instance, a short statement before testifying on a bill — is sufficient in some cases. But the decision on when and how to disclose potential conflicts on specific pieces of legislation, in writing or verbally, is left largely to individual lawmakers. New Hampshire has a legislative ethics committee that’s supposed to act as a watchdog to prevent legislators from letting their outside roles blend too closely with their job at the State House. But the committee operates from the premise that those roles are bound to intersect in a citizen legislature. When it comes to regulating the boundaries of those personal and public roles, the committee is largely reactive: It doesn’t audit lawmakers’ filings or look closely at individual conflicts of interests unless asked to do so. “We don't really act unless there is a complaint that's made,” Gordon said. As a result, it can often be hard to know where lawmakers’ private interests end and their public interest begins.